Place orders. View proofs. Track shipping. Do it all from one password-protected area. Annual reports are a direct reflection of your company. Be sure yours say "professional" and "trustworthy." We'll deliver exactly what your business needs to make the right impression at the right time. When it's time for the big event, put your brand on center stage. Team up with us to create your trade show display, and make every second count. Make ordering supplies and marketing materials a piece of cake with a designated area on our website that lets you see past projects and reorder with just a click or two. We're all about making life easier. 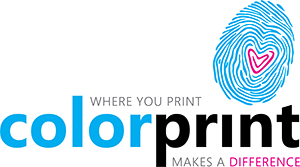 Colorprint has provided high-quality printing and mailing services for more than 25 years. Our customers receive personalized customer care every step of the way. They also know they are hiring a local company who is completely invested in the local community. We believe people want to be helped by friendly experts. That’s what you experience with Colorprint. From the initial concept to final delivery and all the details in between, you’ll receive the support and advice that your project requires. We start early, answer the phone, and have a team of highly experienced print professionals. A little old fashioned, but it works for us. Beyond customer care, we pride ourselves on supporting the local community. This includes donating 25% of our profits to local charities that work with community members in need. Over $150,000 in donations over the past few years. Our services include full-color offset printing and fast turn, on-demand digital printing. We also offer mailing services, direct email, and design for projects large and small. In Burlingame and beyond, we enjoy a tremendous reputation built job by job over the past 25 years. When you choose Colorprint, you'll have a valued partner throughout your project—a partner who answers the phone when you call, helps your job come in on time, on budget, and is committed to making a real difference in the community we serve. Submit your project information today for a free quote.